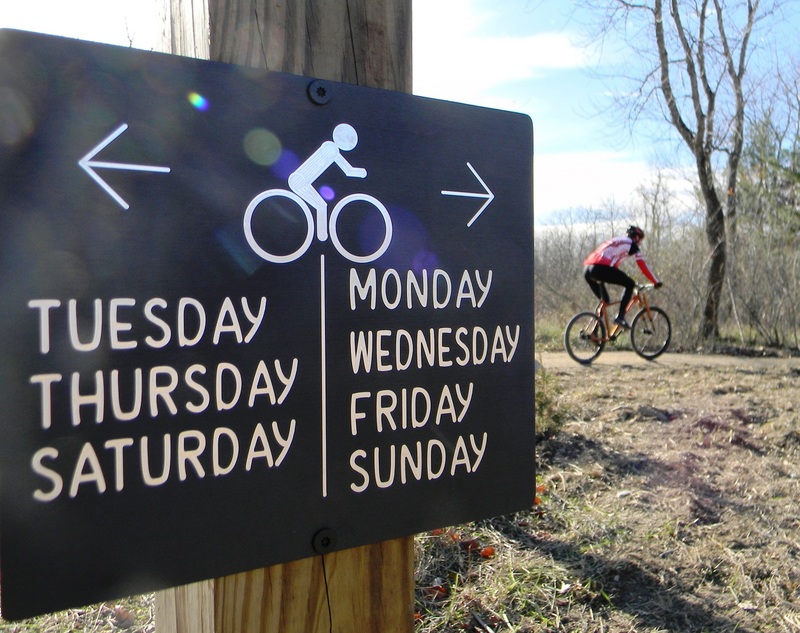 The first-ever mountain bike trail in Cuyahoga Valley National Park opened in November 2015! East Rim Trail boasts stunning views, varied terrain, exciting obstacles, and an element of adventure for anyone who explores it. The trail is designed for mountain bikers, but hikers and runners will love this challenging trail as well. Ultimately, the trail will measure nearly 10 miles and connect to a system of bike trails over 100 miles long. Take Route 8 to Boston Mills Road. Go west on Boston Mills Road, past Olde 8, and park at the Bike & Hike Trailhead parking lot. You’ll ride your bike north on the Bike & Hike Trail a short distance before you come to the access point for East Rim Trail. Daily, the trail will be open from 6:00 a.m. until 11:00 p.m. for bikers and as posted for other trail users. In wet weather, the trail will be closed to all users to prevent damage. Biking, running, and hiking on wet trails can cause ruts and footprints that would take hours to repair back to a smooth riding surface. Trail conditions will be monitored daily by volunteer trail stewards and posted on CVNP’s Twitter account @CVNPmtb, the alerts section of nps.gov/cuva, and posted signs at the trailhead. You’ll be amazed at how much diversity is packed into this relatively short 2.3-mile trail. The terrain is relatively flat and smooth at first but quickly hits a couple of tough rock obstacles and sharp turns. The trail is full of steep downhills and ascents and will keep any biker on their toes. Trail aside, the scenery is incredible. Every time you make a turn or crest a hill, you’ll be met with another gorgeous view. You’ll pass through towering forests that seem to stretch on forever and dense woods that make you feel like you’re passing through a tunnel. The diverse scenery all flows together cohesively into a gorgeous microcosm of your national park, a perfect adventure. Mountain bikers looking for a new challenge. This trail is the first of its kind in CVNP, which means a lot of folks have been waiting a long time to enjoy it! East Rim also offers a unique trail experience for trail runners and experienced hikers, though all foot traffic must yield to mountain bikers. Given its challenging nature, this trail is not suited to families with small children, people with mobility issues, or brand-new mountain bikers.